More and more adults are becoming teetotal. Granted there will always be a place for alcoholic drinks, but this up swell of non-alcoholic drinkers are going to be increasingly demanding an appealing range of drinks and one that does not necessarily feature the usual iconic brand line up. The result is soft drinks now need to not only appeal to children or the designated driver, but to also live up to the expectation of being an interesting beverage in their own right. In addition, with so many different quantities of visitors to sports and leisure venues, the key is to also be able to scale up (and down!) the soft drinks offering and make it profitable. The challenge is making the teetotal drinker enjoy all the experience that the alcoholic drink delivers, be that its presentation, the varieties available or simply down to the taste. The other aspect to consider is that many who drink non-alcoholic drinks also do not want the sugar levels that are typically associated with carbonated or other soft drinks. Particularly as many are opting for the soft drink option to maintain a healthy lifestyle. This combined with the impact of the Sugar Tax Levy is creating an opportunity for venues to differentiate. 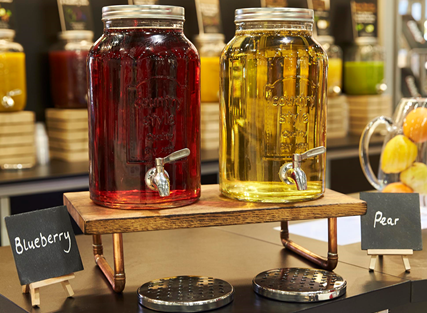 Whether that is through the range of drinks on offer or the way it is served or dispensed, there are a number of ways that venues should be responding to these customer desires. The answer is to have a more intriguing drinks range which through presentation also creates a more interesting and inviting offering. Be that for general bar service or hospitality and conference. Alongside traditional beverages, more unusual flavoured drinks and formats have entered the realm some of which have been deliberately developed to be tailored to reflect the seasons. Different flavoured juice drinks like Peach or Rhubarb also offer an enticing display of rainbow colours. Perfect for a refreshing, thirst quenching drink but these can also be used as a clever base drink, to add a twist to soft drinks simply served with soda or as part of a menu of mocktails. Typically fruit concentrates like these are also lower in sugar and high in vitamin C, so Catering Managers are easily able to respond to any sugar concerns.